This post contains affiliate links, which means I may receive a small commission at no cost to you when you click a link to make a purchase. Are you currently taking supplements for inflammation? 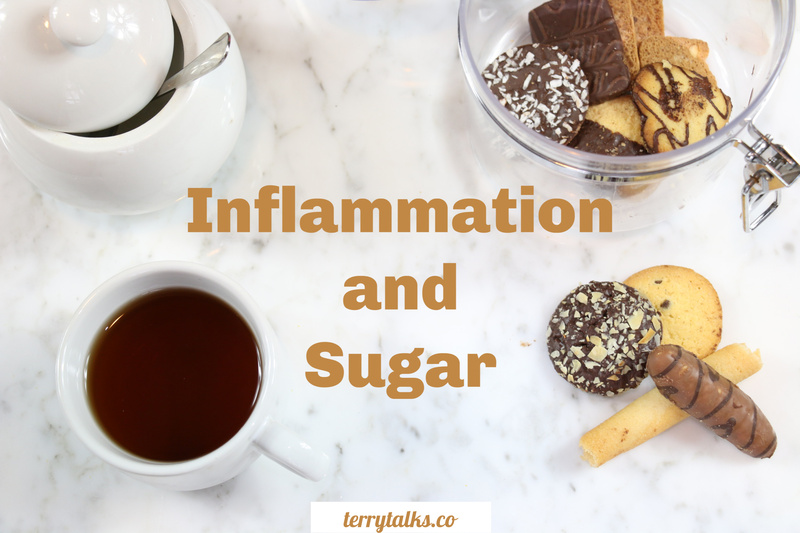 Inflammation and sugar is one topic searched by many who are struggling to find the root cause of their pain. Do you find that no matter what you take for body aches and pains and inflammation, you still experience some level of pain in your body? The reason may lie in your diet and sugar consumption. Sugar contributes to inflammation! More and more research indicates that most disease – including all chronic disease – begins with some kind of inflammation. If you could control inflammation and improve your health, you’d want to, right? Inflammation is vital as part of the healing process. It defends the body against foreign invaders (including bacteria and viruses), repairs damaged tissue, restricts damaging motion through swelling, and a lot more. Some foods, like sugar, can also cause inflammation in the body, which is normal. However, eating too many inflammatory foods may cause chronic low-grade inflammation. This can cause serious health problems, such as heart disease, diabetes, cancer, and allergies. Eating low inflammatory foods can prevent this. One trigger is the food we eat – and sugar tops the list for several reasons. Sugar triggers pro-inflammatory cytokines. Cytokines are small proteins that work as signal molecules. They summon cells to infection sites, trauma, and inflammation. Sugar may promote pro-inflammatory cytokines and reduce anti-inflammatory cytokines. Sugar– A study in the American Journal of Clinical Nutrition found that processed sugars may cause the release of inflammatory chemicals called cytokines. Refined carbohydrates- Refined or simple carbohydrates include sugars and refined grains with the bran, fiber, and nutrients removed. These foods are white bread, pizza dough, pasta, pastries, white flour, white rice, and many breakfast cereals. Saturated fats- like cheese, full-fat dairy, fatty red meat and highly processed fats (hydrogenated and trans-fats) used in processed foods, such as baked goods, stick margarine, and chips. Deep fried foods (which used to be my favorite! ), and the food from many fast food restaurants are high in these unhealthy fats. Food additives-NIH’s National Institute of Diabetes and Digestive and Kidney Diseases (NIDDK) reported that dietary emulsifiers, which are chemically similar to detergents, are added to many processed foods to improve texture and extend shelf life. The scientists investigated whether dietary emulsifiers might affect the risk for colorectal cancer by altering the gut microbiota. processed meat and red meat- Processed meats include meat prepared through salting, curing, fermentation, smoking, or other processes to enhance flavor or improve preservation. Those meats are hot dogs, ham, bacon, sausages, corned beef, and beef jerky, along with canned meat and meat-based preparations and sauces. Alcohol– The World Journal of Gastroenterology reported that chronic inflammation is commonly associated with alcohol-related medical conditions. Gluten- Certain foods are pro-inflammatory and that includes gluten-containing grains and the thousands of foods made from them as reported in an article from the Arthritis Foundation. There is a concern that people who use artificial sweeteners may replace the lost calories through other sources, possibly offsetting weight loss or health benefits, says Dr. Ludwig. This can happen because we like to fool ourselves: “I’m drinking diet soda, so it’s okay to have cake.” This recommendation was also added by the AHA and ADA. Overstimulation of sugar receptors from frequent use of these hyper-intense sweeteners may limit tolerance for more complex tastes,” explains Dr. Ludwig. That means people who routinely use artificial sweeteners may start to find less intensely sweet foods, such as fruit, less appealing and unsweet foods, such as vegetables, downright unpalatable. Artificial sweeteners are also known to cause more sugar cravings, causing us to choose sweet food over nutritious food, and weight gain. Your body cannot process artificial ingredients well, so artificial sweeteners like aspartame may trigger an immune response, according to research. Aspartame is a neurotoxin that the body frequently “attacks” therefore causing inflammation. Artificial sweeteners may increase your risk of type 2 Diabetes by inducing “metabolic derangements,” according to a report published in the journal Trends in Endocrinology & Metabolism. As reported by Business Insider, the research team concluded that all of these sweeteners “had a toxic, stressing effect, making it difficult for gut microbes to grow and reproduce. Drinking sugary drinks can spike inflammation levels. Moreover, this effect can last for a considerable amount of time. For those with arthritis, artificial sweeteners may be a culprit that should be avoided. Experts have recommended that people with this condition to reduce their sugar intake so as not to aggravate arthritis. If you’re sensitive to these substances, your immune system may react, triggering an inflammatory response, according to the Arthritis Foundation. This inflammatory response can cause arthritis symptoms like joint pain and swelling. The resulting inflammatory response may aggravate arthritis symptoms like joint pain and swelling. Today, we have many choices of sugary foods and beverages available to us. Natural sweeteners are available for us to use effectively. they provide the sweetness that most people crave. Here’s a list of natural sweeteners in order based on a low glycemic index and additional health benefits. Monk fruit– Lo Han Extract is also called monk fruit. o Han has a very low glycemic index and low sugar content. This is a wonderful sweetener but it can be hard to find and expensive. Yacon syrup– Yacon syrup is extracted from the roots of the Yacon plant which grows throughout the Andes mountains in South America. Yacon syrup is rich in prebiotic fibers (roughly 40-50%) called inulin and fructooligosaccharides (FOS) which are undigestible by the body but feed healthy gut bacteria. Using Yacon syrup has been shown to reduce obesity and insulin resistance. Coconut sugar– This is a very low glycemic liquid sweetener derived from the liquid sap of the coconut the glycemic index is 35 making it one of the lowest of natural sweeteners. The fructose levels are very low at 10% and it contains a wide variety of antioxidants, minerals, and other nutrients that enhance blood sugar stability. Coconut sugar is my second choice in sweeteners. Raw honey, organic- is superfood does have an effect on blood sugar and contains approximately 53% fructose so one should only consume this in moderation. This is my personal favorite and first choice in sweeteners, as it takes less to sweeten foods. Molasses is a byproduct of the processing of sugar. It does have an effect on the glycemic index and must only be consumed in moderation. Maple syrup– contains sucrose, glucose & fructose and therefore has an effect on blood sugar and insulin levels. Sugar triggers AGEs (advanced glycation end products). Other foods high on the glycemic index do, as well, by promoting high insulin release. AGEs stimulate inflammation and have been linked with diabetes, cardiovascular disease, and such age-related diseases as Alzheimer’s and stroke. Suppresses white blood cell activity. White blood cell activity is a natural part of the healing process. When the process is suppressed, healing may be incomplete. Chronic inflammation can result. Triggers the release of inflammatory prostaglandins. Prostaglandins are short-lived, hormone-like chemicals, produced by the body’s cells. Instead of moving through the bloodstream, these hormones move from cell to cell and regulate all kinds of cellular activities. Consuming too many added sugars and refined carbohydrates can lead to an excess amount of advanced glycation end products (AGEs). AGEs are formed as a normal part of metabolism; however, with a surplus of glucose (from added sugars and refined carbs in our diet), excessive AGE formation occurs. Having too many AGEs contributes to oxidative stress and inflammation by binding with our cells and integral proteins, changing their structure and interfering with their normal function. This alteration can eventually lead to a buildup of plaque in our arteries (atherosclerosis) and decreased kidney function, among other effects. Also, as many of us know, a diet rich in added sugar and refined carbohydrates can often lead to weight gain and obesity. Excess body fat, especially in the abdominal area, causes continuous, chronic levels of inflammation that can alter the action of insulin. Insulin is a regulatory hormone that plays an important role in transporting the glucose in your bloodstream into your cells, where it is used as energy. However, with chronically high levels of blood glucose, the production and regulation of insulin are altered, and insulin resistance can result. Consequently, the excessive amount of blood glucose can lead to an accumulation of AGEs. I’ve always learned that taking supplements for inflammation was the only answer. I never looked at my diet and sugar intake as the contributing factor to my pains, but once I eliminated refined sugar from my diet, and added low inflammatory foods, I experienced new results! No pain! I first started with low sugar intake, then eventually I eliminated refined sugars from my diet altogether, then I started to see results of the decreased pain, and today, no knee pains. Chronic inflammation is often a result of diet and lifestyle, so you can take important steps to minimize inflammation and its harmful effects on the body. Limit unnecessary sources of added sugar and refined carbohydrates in your diet. Minimize your consumption of foods with low sugar intake. (These foods are listed on the food label as sucrose, low inflammatory foods, glucose, high fructose corn syrup, maltose, dextrose). Also foods with refined carbohydrates (this includes many processed foods such as pasta, white bread, and white rice). Eat more whole grains. Choose whole grains such as whole wheat pasta, brown rice, quinoa, and barley. Due to the high fiber content, whole grains can help slow down absorption. They do this by decreasing the speed at which sugars enter the bloodstream. Increase your daily intake of vegetables and fruit. Fruits, vegetables, and whole grains contain complex carbohydrates and naturally occurring sugars. These foods also contain antioxidants, vitamins, and minerals which conversely help to reduce AGE formation. Additionally, fruits and vegetables are high in fiber which can help decrease the rate at which sugar enters the bloodstream. Try to get at least 10 servings a day. Include a variety of antioxidant-rich foods and heart-healthy fats in your diet. Other sources of antioxidants include flax, chia and hemp seeds, avocado, nuts, wild salmon, omega-3 rich eggs, olive and canola oil, and small cold water fish such as mackerel, herring, and sardines. Eating these foods on a regular basis will help to counter inflammation and reduce oxidative stress. Maintain a healthy lifestyle. Factors such as exercising regularly, managing stress, and not smoking can help to reduce inflammation. Maintaining a healthy weight is also important in promoting proper insulin function. If you find that after doing all these things, even a low sugar intake, you still experience the same level of pain, then supplements for inflammation may be needed. Always remember, speak with your doctor before trying any new diet or supplements. If you need another form of sugar to use in your foods, try coconut palm sugar or raw honey. I used raw honey most of the time. Occasionally, I use coconut palm sugar in my baked recipes instead of sugar. Try these and see how you like them. What remedies do you use to reduce inflammation? Take my free Course “Diet Makeover” to revamp your current diet. You’ll receive weekly lessons right to your inbox so you can move from nutrient-deficient to nutrient-dense. This is the same makeover I used to lower my husband’s cholesterol, eliminate high blood pressure for my 12-year-old son, and wipe out severe eczema. If I can do it, so can you!